Dance and theatre often explore the power of rhythmical playing, with words and their sonority, without attaching a special significance to them. When the hands dance, the gestures cannot be translated by one language, but one can feel the emotional intensity with which the actor-dancer performs. For the traditional actor-dancer, the emotion portrayed is a result of the fabric of all predetermined movements, far from any interpretation inspired by previous experience. For the audience and some contemporary performers, the feelings are complex and attached to their memory. Come discover this world of rasa with Katia Legeret-Manochhaya in this book – Dance Theatre of India: Crossing New Aesthetics and cultures! 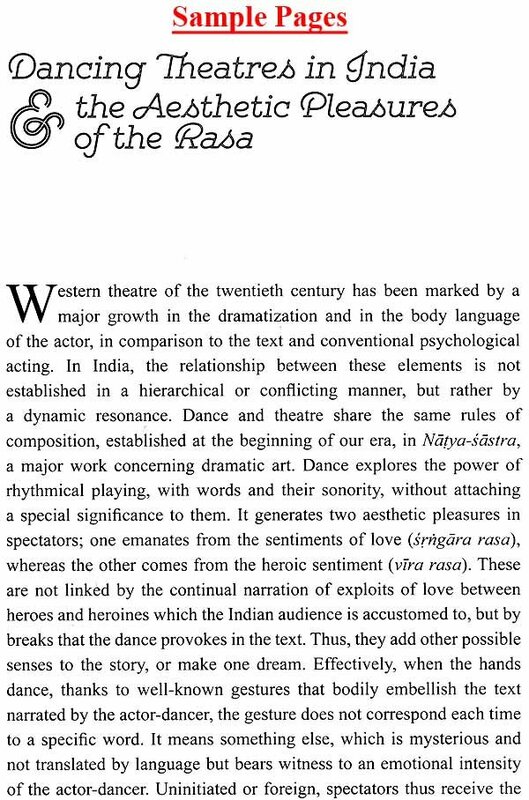 At the heart or Indian literature, Dcute Theatre of lndia by Katia legeret-Manochhaya is a book where the author explores the various rams or Bharata-natyam and other dance forms, both as a dancer and a researcher. In the milieu or diverse linguistic and cultural interpretations. the book is a field or experimentation where the modalities for expressions and cultural differences would forever reinvent themselves. The photographic portraits or various Iive dance performances throughout the book uphold the author's perspective for• the readers. As one browses through the pages. one is transported to a world or dance and drama reading the various expressions or the artists in colourful costumes narrating stories from all over the world. 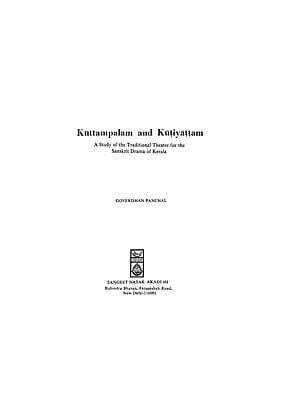 The examples proposed are linked with knowledge which derives from the erudition or Sanskrit texts or from the collective creativity or artists from several cultures or India and other countries. Like the art forms it discusses. the book is a trans-cultural piece of work in its very essence. Katia Lcgeret. Ph D. is Professor of Performing Arts and Aesthetics in the Department of Theatre at University Paris X. and director of the research laboratory FA 1573. part of the doctoral school EDESTA: Aesthetics, Sciences and Technologies of the Arts. She is particularly interested in the aesthetics of Indian dance and theatre with regard to traditional and modern aspects, this theatre's influence on European directors and how it is staged theatrically in contemporary France and l.Europe. Since her adolescence. and in parallel with her studies. Katia legeret aka Manochhaya has pursued professional training in Bharata-natyam (dance/theatre of South India). her training began in France with Amala Devi (a disciple of Ram Gopal) in the Dance Studies courses in The Sorbonne in 1979. This was followed by several years in Chennai, India. with K. Swarnnamukhi (Tamil Nadu's State Dancer). In 1985. she began to study with Venkatalakshamma in Mysore (Karnataka). and since 1986. she has performed the work of K. Muralidhar Rao (Pandanallur style) and has created an international career in the Bharata-natyam style. As a choreographer and director. Manochhaya-Katia Legeret has composed several performances as dance-Poem (Paris. Menagerie de verre, 1998). 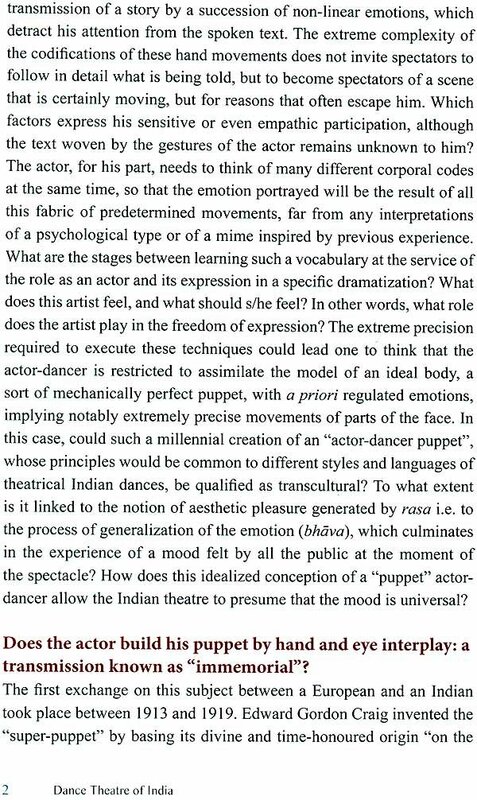 This essay discusses the conditions for creativity in Indian theatres and dance when these are in certain specific contemporary contexts which involve a relationship with people from other countries and alterity. We shall discuss the process for the translation of literary texts which are staged and choreographed as well as the transpositions of body language codes into other languages and cultures. Have the so-called "traditional" arts of India linked to dance, theatre and body movements defined these questions in their rules and transmission processes? Or is this question closely linked to colonization, post- colonial studies or the international commercialization of art? 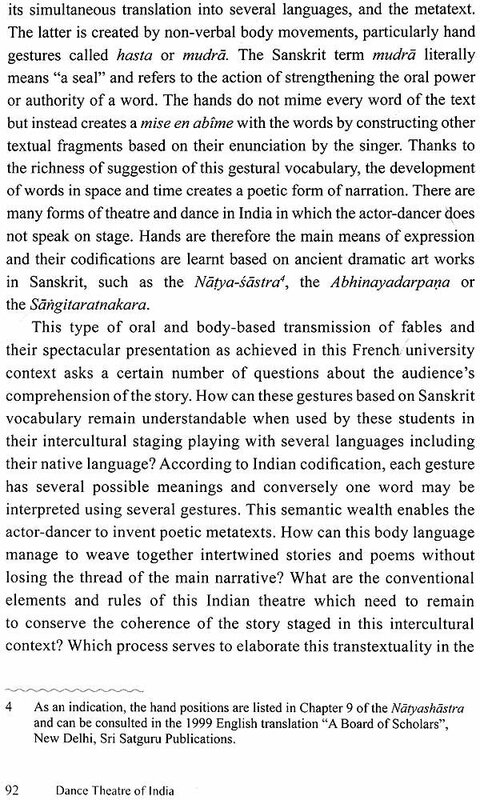 How do such artists adapt to "foreign" texts, stagings and audiences whether in India or abroad? How does this situation, which is sometimes linked to exile, stimulate their creativity? Are their aesthetic thoughts linked to a renewal of their art? Or conversely are they influenced by contemporary trends and a position of opposition to or even questioning of their own artistic practices? In particular regard to this subject, we shall see how dancing, acting and performing poetry enables these artists to preserve a certain level of suggestion, shadow, mystery or that which is unspoken to escape the language of communication, cultural limits and certain social conventions. However, are they thus seeking a trans- cultural dimension in their poetic gestures and in their bodies which have become a "poem"? A body language which crosses all cultures? Would there be a risk of their practices being universalized if cultural differences are erased? Or of universalizing their aesthetic theories like, for example, the Rasa theory on the spectator's reception which links pleasure and knowledge? All our research concerns artists and researchers from both India and Europe but its originality lies in the fact that all the discourse and creations cited are produced by artists who are also researchers or vice versa. Giving artists an opportunity to express their views thus enables us to better understand how expert knowledge can be developed through the practice of an activity involving the body. Researchers are actually immersed in these processes and are not just "participating" observers. Since 2008 when my book Danse contemporaine et theatre indien: un nouvel art? (Contemporary Dance and Indian Theatre: A New Art?) 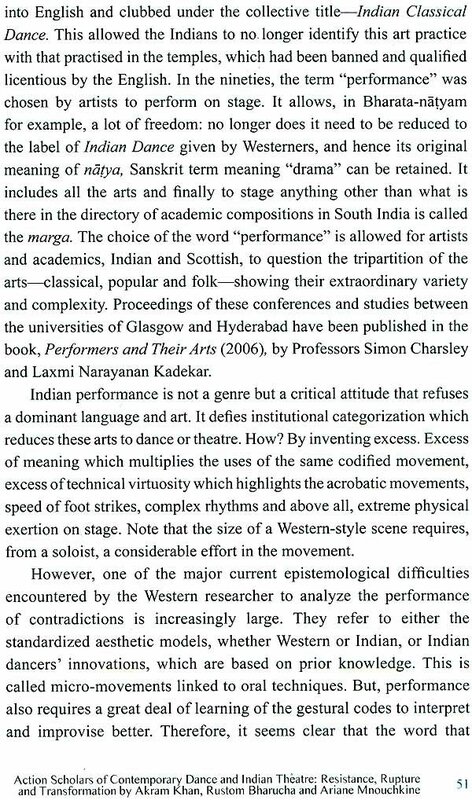 was published, I have considered it difficult to classify Indian theatre. and dance according to Western professional artistic categories. This is because actors in India are also dancers, musicians and storytellers. Bharata-Natyam is a form .of dance theatre like Kathakali or Odissi. In any case, reducing it to dance alone would be disrespectful to the immense acting work required to act out the stories of major literary texts such as the Mahabharata or the Ramayana. 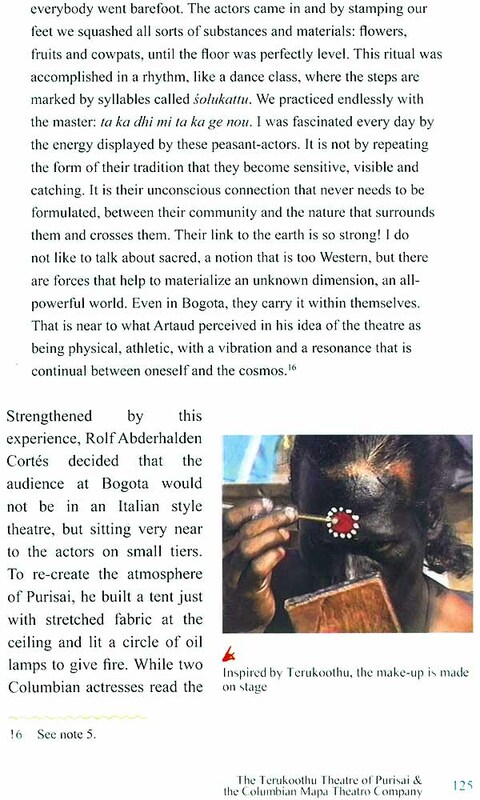 In 2000, the performance of Bartabas's Triptych (Zingaro Equestrian Theatre, France) included Kalarippayatt martial arts specialists who were considered to be contemporary dancers by the audience and the French press because the symbolic aspect of their movements inspired by animal movements was not "translated". 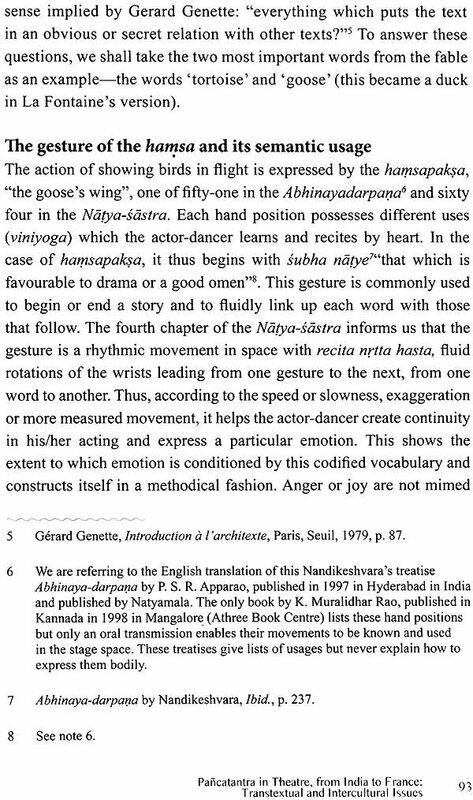 The Kuchipudi artist, Shantala Shivalingappa, uses codified hand gestures (mudra/hasta) in her personal creations but, when invited to perform as a contemporary dancer, the links these gestures have with mythology, literary texts and Indian culture are cut off. I am interested in the new relations between dance and theatre. According to the most ancient principles from the Natya-sastra, a founding text in India for the dramatic arts, dance and theatre, the two go hand in hand. But are their coexistence and mutual inspiration still relevant now in India and internationally? How do today's dancers use their rhythmic movements to deconstruct or transform cultural codes and inherent gestures from actors' traditional vocabulary? 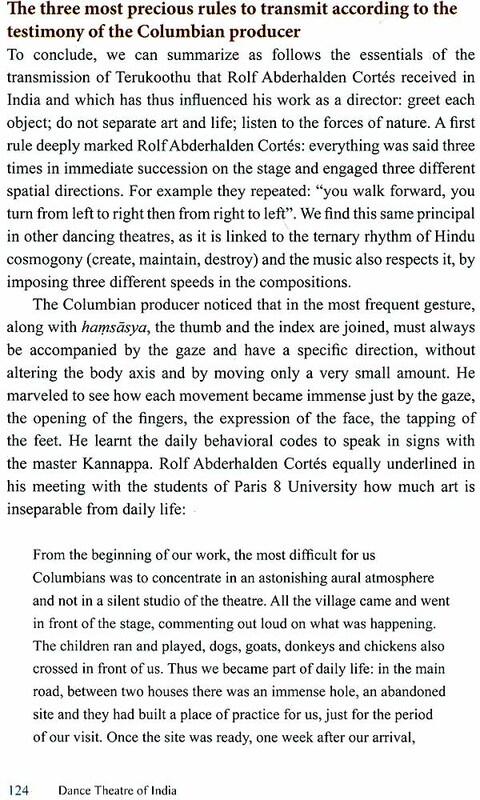 Also, conversely how does the intracultural approach of a rural experimental theatre that was specifically adopted in Rustom Bharucha's research enable European influences or the idea of a universal comprehension of cultural codes to be resisted? Similarly, why does dance seek to get away from the theatre as a place of production of a pre-established religious, social, political or economic meaning? To better understand these processes, we could look at the gestural practices of actor-dancers who have been trained in "classical" styles. For example in the Kathak form, we shall look at how Akram Khan and the Master, Birju Maharaj transform certain of their gestures to enhance communication with an audience from other countries. Conversely, street theatres in Bangalore which are linked to NGOs appropriate and reuse culturally codified gestura languages to portray current affairs issues and social problems. In another way, in 2005 the European Rimini Protokoll created Call Cutta in which it aimed to denounce the commercialization of art and instead propose another poetic and trans-cultural space. There are, therefore, frequent cases of the notion of performance overriding the idea of dance and theatre categories. However, in the "classical" arts such as Bharata-natyam, such borders are porous because creators have to simultaneously be choreographers, musical conductors and directors. An artist working in this field has three professions from the standpoint of Western categorization of the arts. 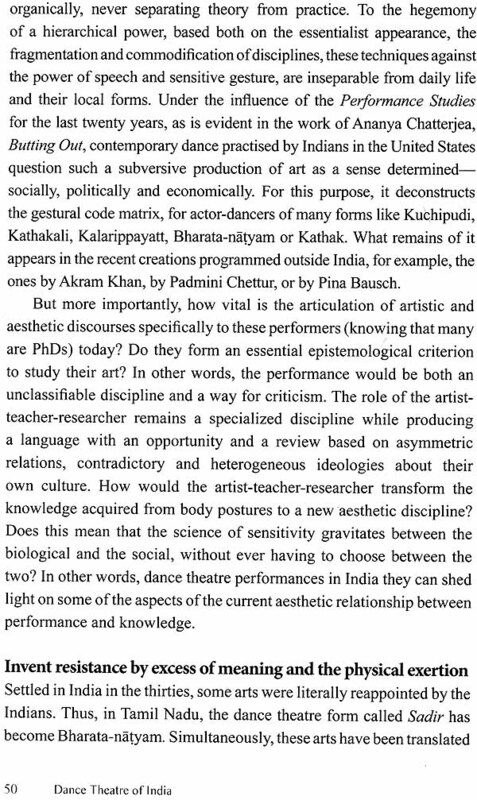 To help us understand how this idea of total art works, the aesthetic theories from the Natya-sastra, from its commentator Abhinavagupta along with those from the Abhinayadarpana and the Sangitaratnakara are precious but are also always linked to very precise staging techniques. For example, the notions of rasa, creativity and improvization will be analysed based on stagings of the Ramayana in the Mysore Bharata-natyam style. These questions will provide an opportunity to discuss the modes of transmission of this art and its recognition as part of cultural heritage by taking Mysore as an example. Currently there are hundreds of Bharata-natyam schools and they exist in all of India's major cities. It is also the most commonly practiced and performed style in other countries. However, is it possible to speak of a historical continuity from generation to generation? This art is founded on exclusively oral transmission. So how is it possible for it to be preserved as part of our cultural heritage? Unlike in the state of Tamil Nadu, which instituted Bharata-natyam in the town of Chennai in 1932-a radical break with previous practices, the heritage of Mysore is made up of the renewed diversity of places of creation and texts in Kannada while maintaining a permanent relation with temples and the Maharajah's palace. One of my European research works is based on an artistic creation (staging) which I have directed at Paris 8 University since 2010 with professional French and Indian actor-dancers. They work with students on adaptations and rewritings of several of Jean de La Fontaine's Fables inspired by Pancatantra stories. Natyacarya K. Muralidhar Rao, who taught me Bharata-natyam at Mysore, composed it and translated it in Kannada language. I have adapted it to transmit his compositions to these students. This work is based on body movements through highly varied gestural codifications- those used in the Indian theatre and those from their own cultures. This type of "cultural mix" among languages, musical rhythms and gestures makes it impossible to separate creativity and the critical function of art with relation to an ethnocentric reading of literature.